Ok, so you just finished your first semester of nursing school and it feels amazing! It was probably the hardest, but most fun, and most emotional semester of your life … and now that it’s over, you probably loved every second of it. Hindsight is such a wonderful thing! The hard work is real, but the reward is just as real. You have learned SO MUCH. Clinical placements are what have kept you motivated to read and study. The patients to whom you were assigned will remember you for the rest of their life! The patient to whom you administered your first injection, the patient to whom you performed your first accucheck … their faces are imprinted on your mind. You will be forever grateful to them for allowing you to practice and perfect you skills as a nursing student. Your clinical and classroom professors, as well as fellow nursing students, have likely become your rocks to lean upon. 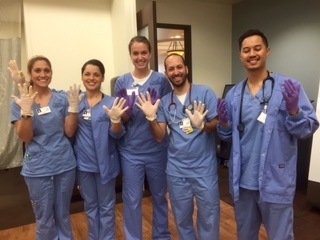 It’s tough to think about making it through the nursing program without having them on your team. Cultivate your personal team as you move through the nursing program. 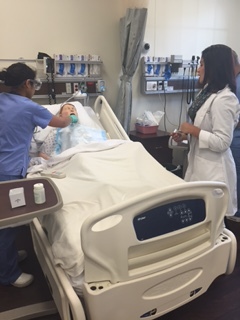 The fall semester for 1st year MEPN students culminated with a ‘Skill-A-Thon’ in the Simulation Center which was mentored by 2nd year MEPN students. 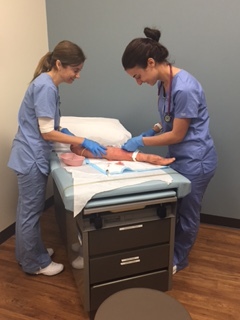 Students rotated through stations such as medication calculation, NG Insertion, IV starts, and dressing changes. This objective of this activity was for 1st year MEPN students to review newly acquired skills as well as for 2nd year MEPN students function in the role as Nurse Educator.